I'm back in Australia for a family reunion and a school reunion, so I organized a Thermomix demo for my mother and aunts. Only invited a few of the aunties - so we were just a small group of 13! Nancy Day came and did a brilliant job of showing us what the Thermomix can do. We did the Basic demo plus. We started with a fluffy berry desert, then went back to starters: cashew, sun-dried tomato and pepper dip. We whipped up some butter and bread rolls, pesto, mayonnaise and coleslaw, tried to make a sponge cake (which may have worked if we had added the sugar!). Followed this by steamed chicken with vegies and rice - with a spicy coconut sauce............ and the finale was a lemon custard. We ate the "sponge"with the lemon custard. I loved the custard and it's so easy to make. The recipe is in the Basic Thermomix recipe book: you just throw in the eggs, milk, cornflour and sugar and whatever you want to flavor your custard with, then after 8 minutes, speed 4, at 90, it's done! My Thermomix arrives just after I get back home in Switzerland, can't wait to start cooking! My mother wants one too, but I doubt if it will arrive before I leave. 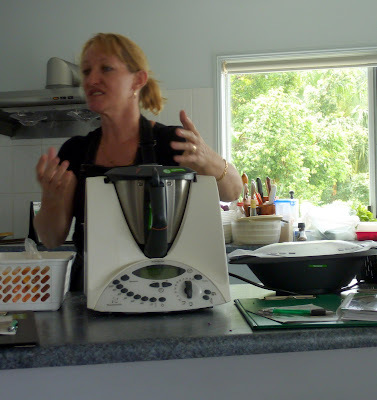 If you live in the Cairns area and want to look at the Thermomix, contact Nancy (Phone: 07 4098 5561, Cell: 0447 487 716, Email: thermomix.nancy@bigpond.com). She's so passionate about Thermomix, you can't help be swept up by her enthausium!